Our latest Group Writing Project is complete! Messages About New Growth is available to you today. Download the PDF here. We encourage all of our contributors and everyone in our community to share this finished project with others - spread the encouragement far and wide! If you are willing to write something exclusively for Faithful Bloggers and would like to be part of our next Group Writing Project, we'd love to have you join us. What is a Group Writing Project? It's an opportunity for you to submit a written essay that will be published as a collection here on the Faithful Bloggers website. Every participant will have permission to gift the collection to their own subscribers and readers as well, so our work will spread far and wide and touch as many lives as possible. The theme is 'New Growth' in the life of believers. Have you survived a long cold winter spiritually speaking and now feel like you're coming out of it with important lessons and fresh new fruit in your spiritual life? We'd love to hear your story and advice for those why may still be in a tough spot. Include a 50 word author bio with one link to your blog. Oh, and of course, please do a spell check! A couple weeks ago we started the "Why Do You Blog?" group writing project. We had 19 bloggers participate and all the entries are awesome. I have complied all the entries into a special report for you to download, read, and share. Just click on the download link below to get it. We haven't done a group writing project in a long time. I think it's about time for another one. I have been getting a lot of emails lately from people who want to start blogging but are unsure if it is really the right thing for them. So I thought the topic of "Why Do You Blog?" would be an excellent group writing project. It will allow others to get various view points on the purpose of blogging and help them determine if it would be a good fit for them. Each blogger that wishes to participate will write a post about the chosen group writing project topic on their blog. Once the post is up, the blogger will need to leave their link in the comments section so that everyone can read it. Once everyone has submitted their posts, I will publish a round up of all the posts with links back to the blogger’s blog. The entire writing project will then be complied into a special report for the bloggers who contribute to giveaway for free on their own sites. I will also be submitting the special report for download on the Kindle. If you don't want to appear in the special report, please let me know in advance. Your post can be as long or as short as you want. Anything goes - though I have the right not to include any posts that do not include the chosen theme or are not family friendly. You will have until Thursday, February 7, 2013 to write your post and leave a link to it in the comments section. Oh yea, there is a prize for participating too. 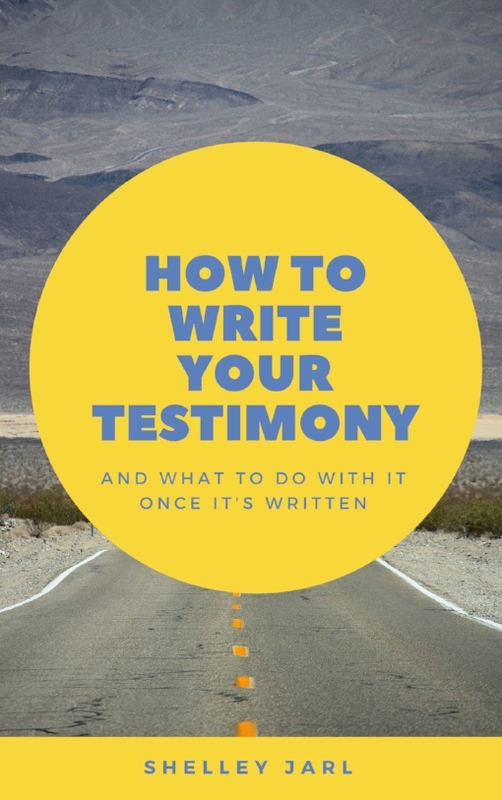 Everyone that participates (those who actually write a post and submits the link) will be put into a drawing to win a free a copy of my report, Creating Christian Content. I can’t wait to read everyone’s posts! A couple weeks ago we started a new group writing project based on 1 Thessalonians 5:18. We ended up having 13 bloggers participate! I complied all the entires into a downloadable special report. Feel free to download and offer it on your blog as well. Just click on the ecover below to download. Ina, Caregiving with Purpose - Thankful Thursday: How Can I Reduce Caregiver Stress In Alzheimers Symptoms? Tobi, Simply Jesus Ministries.. - Alarm Clock, Cute Kid, or a Rooster.. it's what happens next that matters most. Are you ready for another group writing project? I thought with Thanksgiving coming up just next month, thankfulness would be a great topic for a group writing project. I chose 1 Thessalonians 5:18 as our main verse, but any verse on thankfulness would work too. Each blogger that wishes to participate will write a post about the chosen group writing project topic on their blog. Once the post is up, the blogger will need to leave their link in the comments section so that everyone can read it. Once everyone has submitted their posts, I will publish a round up of all the posts with links back to the blogger’s blog. The entire writing project will then be complied into a special report for the bloggers who contribute to giveaway for free on their own sites. I will also be submitting the special report for download on the Kindle and Nook. So if you don't want to appear in special report, please let me know in advance. Your post can be as long or as short as you want. It can be a personal testimony, a devotional, or Bible study in nature. It can be a photo that you believe describes the verse. Anything goes - though I have the right not to include any posts that do not include the chosen theme. You will have until Friday, October 28, 2011 to write your post and leave a link to it in the comments section. Oh yea, there is a prize for participating too. Everyone that participates (those who actually write a post and submits the link) will be put into a drawing to win a free a copy of my report, Creating Christian Content. I can’t wait to read everyone’s posts! Normally I have everyone choose a from a list of verses based on the topic, but The Death, Burial, and Resurrection is such an important message and spoken all through-out the Bible, that I'm not going to do that this time. You can choose to base your blog post on any verse you wish, as long as it fits the topics - The Death, Burial, and Resurrection. Your post can be as long or as short as you want. It can be a personal testimony, a devotional, or Bible study in nature. It can be a photo that you believe describes the verse. Anything goes. You will have until Friday, April 1, 2011 to write your post and leave a link to it in the comments section. I know Easter isn't until April 24, 2011, but I want to make sure I have time to get the special report together and in everyone's hands before then to share. Just copy the code in the box above and you can display the contributor image that links to the direct download of the special report. I hope you will help promote the special report. It really is something amazing. Thanks to all of your who contributed. You did an awesome job! A huge thanks to everyone who participated in August's group writing project on Romans Road. It's amazing and heart warming to think that all these Christian bloggers have come together to write about such an important topic - salvation. Below are the links to all the bloggers who participated. I hope you are blessed. Corrie @ Heavenly Crosses - Sin is Death. Is There a Solution? Sandra @ Be Encouraged - Stamped Approved! The special report with all the entries will be coming soon. This group writing project had been so much fun and I have loved reading all of the entries. I've been encouraged, inspired, and moved to tears. I highly encourage you to read all the posts submitted, you won't be sorry. Without futher ado, below are all the bloggers who participated and a link to their post. "The LORD [is] my shepherd; I shall not want." "He maketh me to lie down in green pastures: he leadeth me beside the still waters." Tracey @ Tcsoko's Blog - Designed to Rest: Do You Make God Dizzy? "He restoreth my soul: he leadeth me in the paths of righteousness for his name’s sake." "Yea, though I walk through the valley of the shadow of death, I will fear no evil: for thou [art] with me; thy rod and thy staff they comfort me." Kerri @ Mommy 4 Him - Motivational Monday: The Promise Ribbon! I am in the process of compiling all the entries into a special report. If you do NOT want your post included in the special report, please email me using the contact form and let me know. The special report will be free for everyone to give away on their own blogs. I have contacted the winner of the Twitter background but do not want to reveal her name until I hear back from her. This group writing project has been so much fun and such an encouragement to me. We will be doing this again! I have a fun project for all of us Christian bloggers to contribute on together - a Christian Group Writing Project. How this works is that a blogger will choose a topic from the list provided and write a post on that topic on their blog. Once the post is up, the blogger will need to leave their link in the comments section so that everyone can read it. Bloggers will have a couple days to choose a topic and then 1 week to write the post. Once everyone has submitted their posts, I will publish a round up of all the posts with links back to the blogger's blog. The entire writing project will then be complied into a special report for the bloggers who contribute to giveaway for free on their own sites. 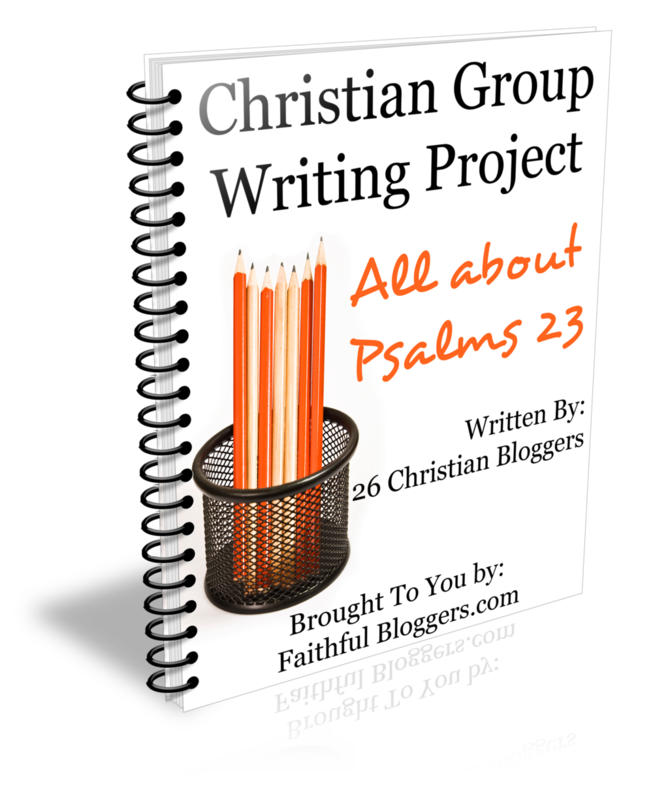 The topic for the first ever Faithful Blogger's Group Writing Project will be Psalms 23. Each blogger will select a verse and write a post explaining what that verse means to them. It can be as long or as short as you want. It can be a personal testimony, a devotional, or Bible study in nature. It can be a photo that you believe describes the verse. Anything goes. 1. The LORD [is] my shepherd; I shall not want. 4. Yea, though I walk through the valley of the shadow of death, I will fear no evil: for thou [art] with me; thy rod and thy staff they comfort me. If you choose a verse, please leave a comment saying so. I understand we may have more than 6 bloggers who are interested in participating and that is fine. Duplicates are fine, but please make sure all verses are accounted for at least once before duplicating choices. You will have until Monday, July 5, 2010 to choose and claim a verse and then until July 12, 2010 to write your post and leave a link here in the comments to the permalink of your post. Oh yea, their is a prize for participating too. Everyone that participates (as in actually writes a post and submits the link) will be put into a drawing to win a free custom Twitter background! I can't wait to read everyone's thoughts on Psalms 23!